A damp basement or cellar is different from damp in other parts a building because of the fact they are below ground. This brings a number of different issues that make damp more likely and more complex to deal with, but whatever your damp basement problem it can be eradicated and here are 7 tips from us, the damp expert to help you do this. Basements and cellars are much more prone to damp because they are below ground and the walls are earth retaining, which are often saturated by groundwater. The moisture from below the ground is forced through the wall laterally, by hydrostatic pressure. If this is not prevented it causes serious damage to the brickwork and internal surfaces. Damp in basements, cellars or vaults can either be prevented by ‘blocking’ it (Tanked) or controlled, using special studded membranes. Because damp basements or cellars are rarely used, they are often poorly heated or ventilated, so the damp and humidity isn’t being controlled, making them quite an unpleasant place to be. Long-term damp can also lead to timber decay, such as Wet Rot and Dry Rot, especially to structural timbers that are built into or in direct contact with damp masonry. All in all, damp problems in underground parts of a building can be quite complex to eradicate so it is important that a thorough investigation is carried out by an expert, prior to any other work being started. External building defects such as leaking rainwater goods, cracked and hollow rendering, defective adjacent paving or paths or blocked and cracked drains, can all add to the moisture that is entering your property and a part of your project should be repairing all external defects. This is the major part of your project and should only be deal with by a specialist damp proofing expert, because using the correct method and materials is crucial. By damp proofing the walls of the basement, the process of water being absorbed through the brickwork or floors will either be blocked or controlled, depending on the method that has been recommended. For long-term protection and a warmer environment, a (CDM) Cavity Drain Membrane system is often the choice of many clients and architects. Alternatively the walls and floors can be structurally waterproofed ‘tanked’. This method of damp proofing ‘blocks’ the moisture from coming in and is carried out by applying slurry coats of a cementitious damp proofing material, between two coats of gauged coats of waterproof sand and cement rendering. We are often asked ‘Do you think it’s a good idea to convert my basement or cellar’ and the answer is usually yes. Because you are fortunate enough to have this unused space, it is best to utilise it. There are many things you can use it for, no matter if the area is big or small, from a new utility room to a full suite, including living rooms, office or even a cinema room. Another great advantage is, whatever you spend on a basement or cellar conversion, will add value to your property, so all in all, a good thing to do. 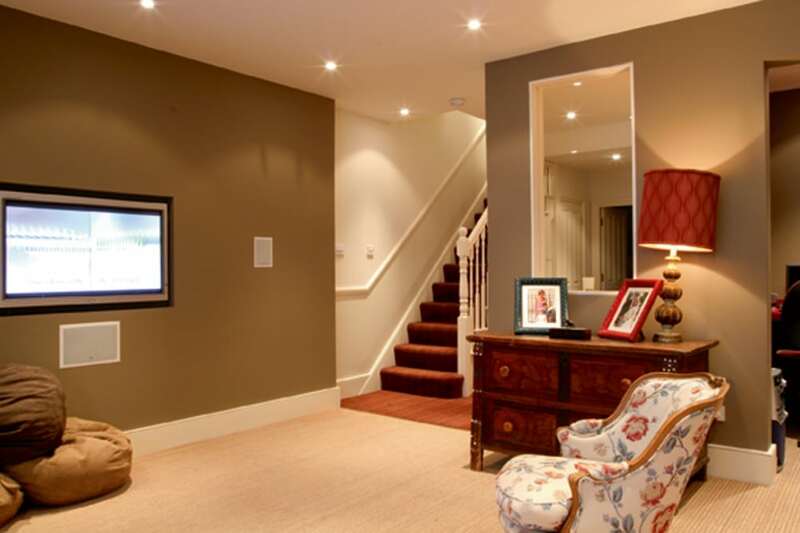 In most cases, it is very practical to carry out a basement or cellar conversion, but there are things you need to ask yourself. The first one is, do we have enough head height? If the answer is no, can the floors be lowered without disturbing the foundations? If you have any doubt, it is very important to take the advice of a Structural Engineer, who will take calculations and advise you. Can I include the services I need? The answer to this is always yes, because there is special equipment for everything, so in all, it is practical to convert your basement or cellar. Can my new rooms be insulated? If the damp proofing system is to be a cavity drain membrane, the answer to this is yes. This is the perfect time to insulate walls, floors and ceilings, before the final linings and plastering are carried out. You can also install all your wiring, plumbing, services and even under-floor heating, making your rooms not only dry but warm and energy efficient. Can I fix things through the walls of my new rooms? The answer to this is a resounding ‘no’. If you or your builder drills any holes in the walls or floors, it will damage the waterproof membrane and invalidate the companies guarantee. It is very important that you know where you want to install certain items and you tell your damp proofing company so they can take certain measures during the installation. Remember, your walls are like an inside out swimming pool, if you make holes in it, it will leak. Finally, a damp expert will often recommend including a drainage system within the basement damp proofing specification. This will be special drainage channels which are set in the floor and connect to a sump chamber and pump. Any water entering behind the membrane will find its way into the channel, divert to the sump and be pumped out to a designated drain. It is very important that the pump is fitted with an alarm and possibly a battery back up system, to alert you should it fail. It is also very important that the pump is serviced annually by the installer. The damp proofing of underground rooms should only be carried out by qualified experts and the blurred line between builder and specialist should never be crossed.